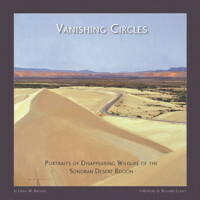 Vanishing Circles is a richly illustrated volume documenting an important museum exhibition and showcasing the beauty and diversity of species rapidly disappearing from the Sonoran Desert Region. Although the underlying premise of Vanishing Circles is bittersweet, this is a stunning, enjoyable book that works on several levels. The sheer beauty of nature is expressed through the individual composition, design, and virtuosity of leading artists; natural history details on each subject further illuminate the elegance of those animals, plants, and places; and biographical information is provided for each artist. These elements, along with conservation information, reference lists, and a glossary make Vanishing Circles a well-rounded introduction to the Sonoran Desert Region. Best of all, Vanishing Circles follows in the path of the famous Arizona Highways magazine, taking readers off the beaten path and into a world that most mortals never see. In one sense, Vanishing Circles is a catalogue that documents and narrates a collection of art depicting threatened and endangered flora and fauna of the Sonora Desert Region. ?In another sense, it is an uncanny manifestation of the land ethic and aesthetic of conservationist, Aldo Leopold. ?The general emphasis of Leopold's aesthetic was on epistemology or biological literacy--that is, on familiarity, awareness, and understanding gained through experience and the study of life within ecosystems. Leopold described this aesthetic in A Sand County Almanac. In Vanishing Circles, author Linda Brewer offers thoughtful descriptions and interpretations of habitats, plants, and animals, opposite full-page reproductions of artworks by some 27 artists, nine of whom (John Agnew, Edward Aldrich, Carel Pieter Brest van Kempen, William Hook, Rachel Ivanyi, Rhonda Nass, Michael Riddet, Ken Stockton, Nick Wilson) form the core of the collection, with 3 or more paintings each. Insomuch as Brewer both closely describes her subjects and advocates stewardship, her essays are clearly cut from the aesthetic and ethical cloth of Aldo Leopold.? Linda M. Brewer is currently manager of the ASDM Press. She was previously a freelance writer, editor, and graphic designer based in Tucson, Arizona for more than two decades, working almost exclusively for environmental and conservation-minded nonprofits. She has been editor of ASDM?s Sonorensis magazine since 2005, and was a contributing author to the award-winning children?s book Katie, of the Sonoran Desert.